I teach a few Photography classes each semester and decided to assign myself a theme that would take me out of my normal realm. I decided to only bring my 50mm lens to document a football game – no telephoto lens and no wide lens. I promise – left them all at home. Needless to say, it was a challenge – but one that I wanted to tackle. Limiting yourself with equipment allows you to explore a different style and many options. This photograph was taken at the end of the game just after the opposing team tried to mount a last minute comeback to tie the score. It was my favorite image of the evening because it representing everything a high school football player plays for – and then it abruptly comes to an end. There are also many elements to this photograph that I like. 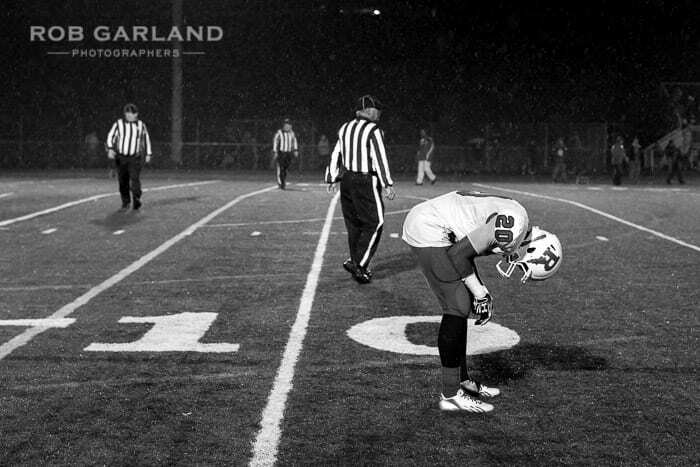 I love that the coach and referees in the background do not intersect each other – the player is alone – the player’s back doesn’t intersect the horizon line – it’s raining, which adds to the mood – it’s shot with all available light – no flash – it shows how close he was – the 10 yard line.